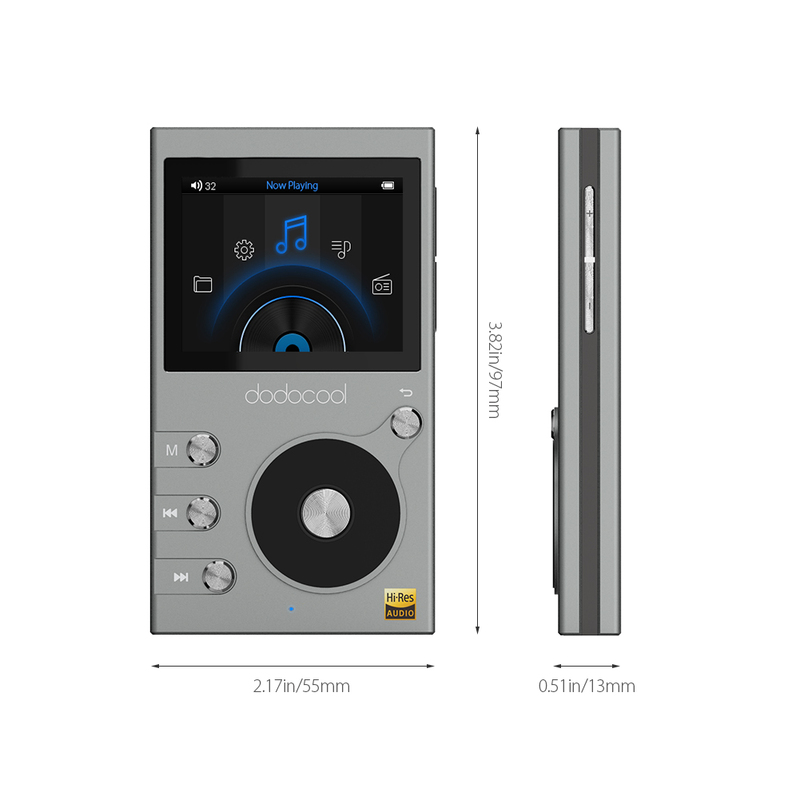 dodocool 8GB Hi-Res Lossless Hi-Fi Audio Player with FM Radio and Voice Recorder is a high-performance Hi-Fi digital audio player with a 2-inch professional display screen. 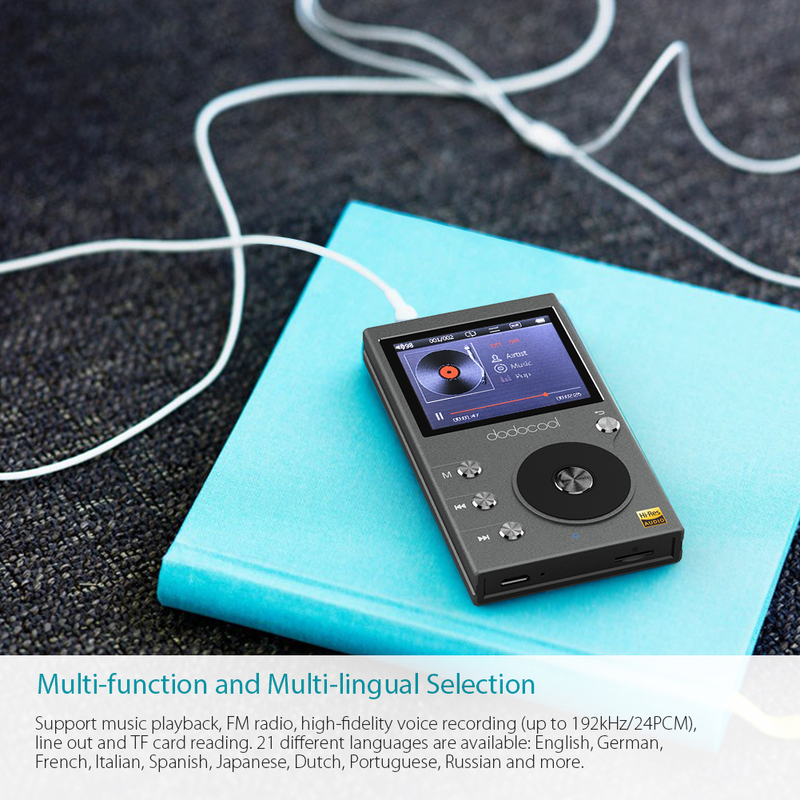 Support DSD64, DSD128, DSD256 (.dff & .dsf), FLAC (up to 192kHz/24bit), ALAC (up to 192kHz/24bit), APE (up to 96kHz/24bit), WAV (up to 192kHz/24bit), OGG, MP3 and more mainstreams audio formats. 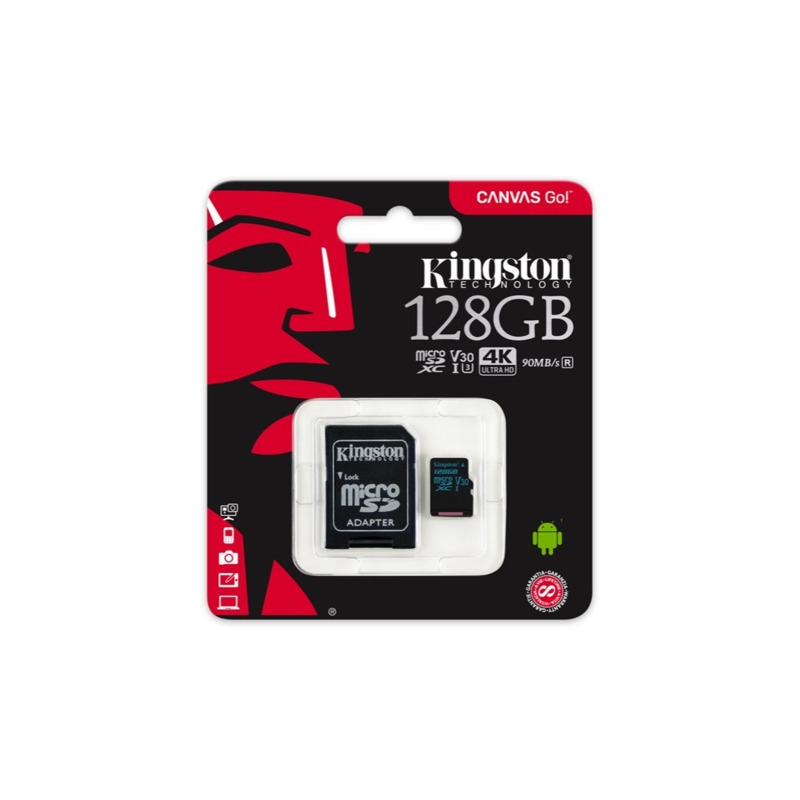 Support TF card (up to 256GB). With the aluminum alloy shell and metal buttons, it is durable and simple to use. 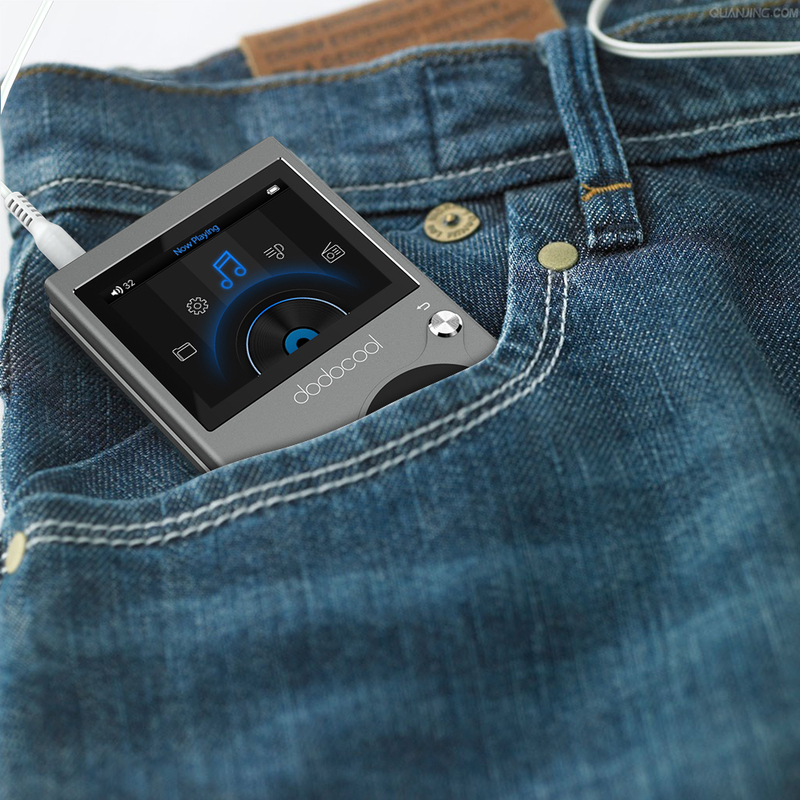 Portable size and high-fidelity sound reproduction make it the best choice for music lovers and audiophiles. Support decoding DSD64, DSD128, DSD256 (.dff & .dsf), FLAC (up to 192kHz/24bit), ALAC (up to 192kHz/24bit), APE (up to 96 kHz/24bit), WAV (up to 192kHz/24bit) and other lossless audio formats. 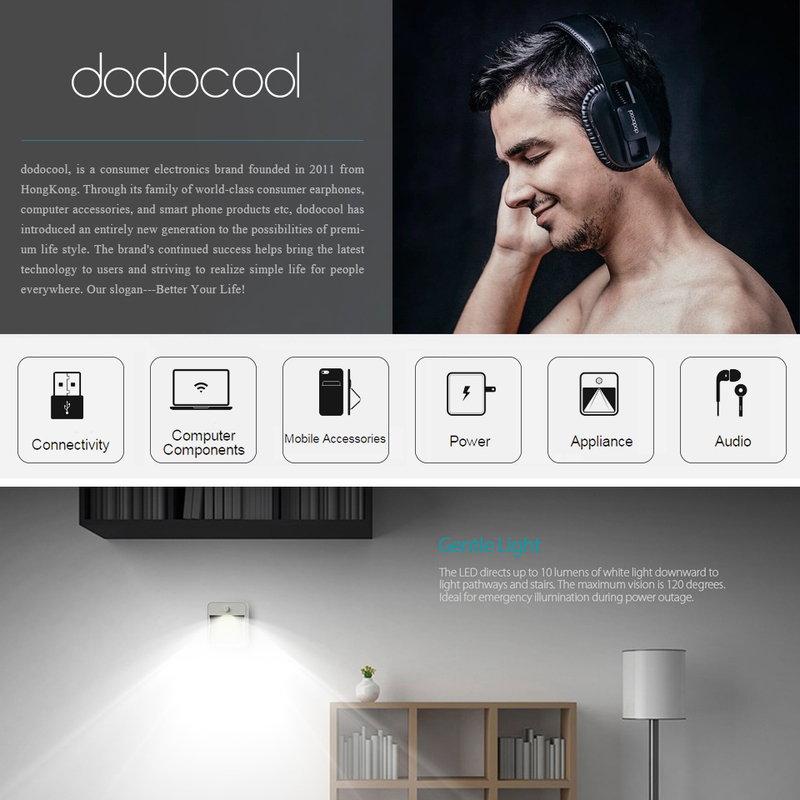 Also support MP2, MP3, WMA and more mainstreams audio formats. 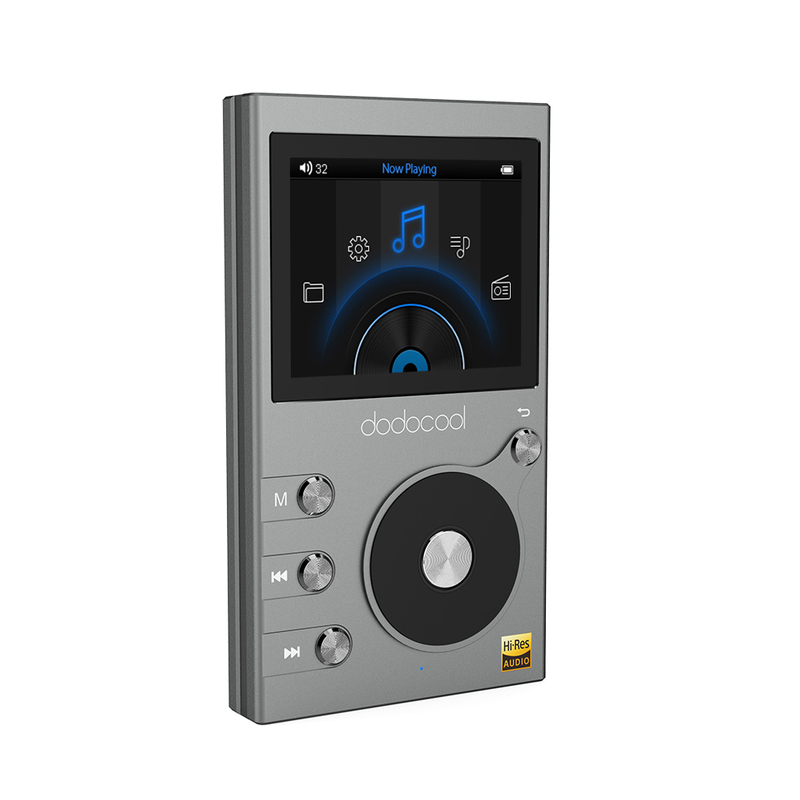 Deliver high-fidelity sound reproduction which complies with the High-Resolution Audio standard (96kHz/24-bit or above) and is much better than CDs (44.1kHz/16-bit). 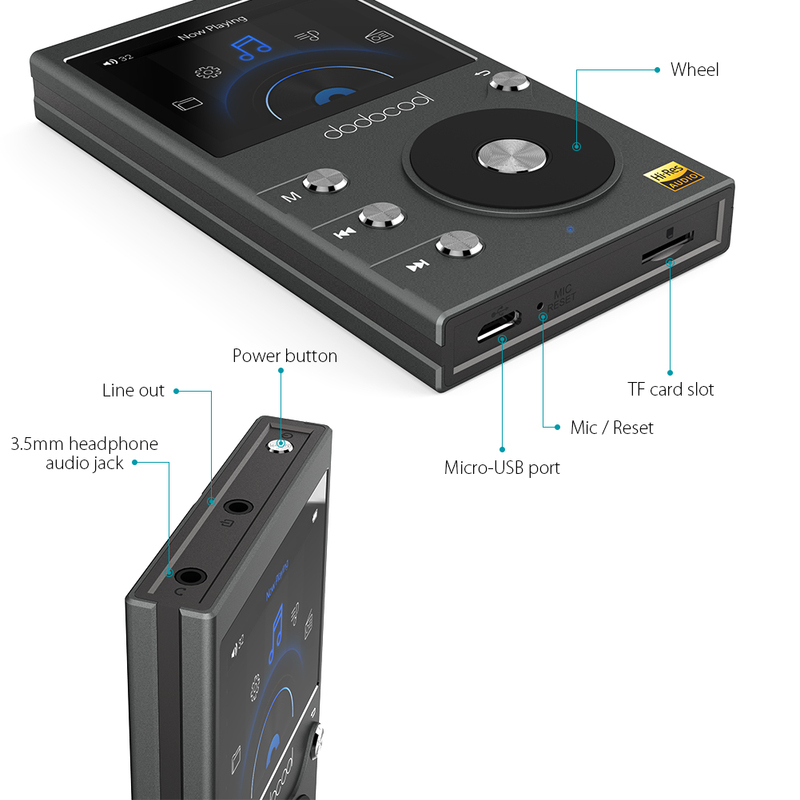 Demonstrate subtle audio details more clearly than conventional music players. Equipped with a 2-inch QVGA LCD display screen (320*240 resolution), it enables you to navigate the menu and relevant information easily. 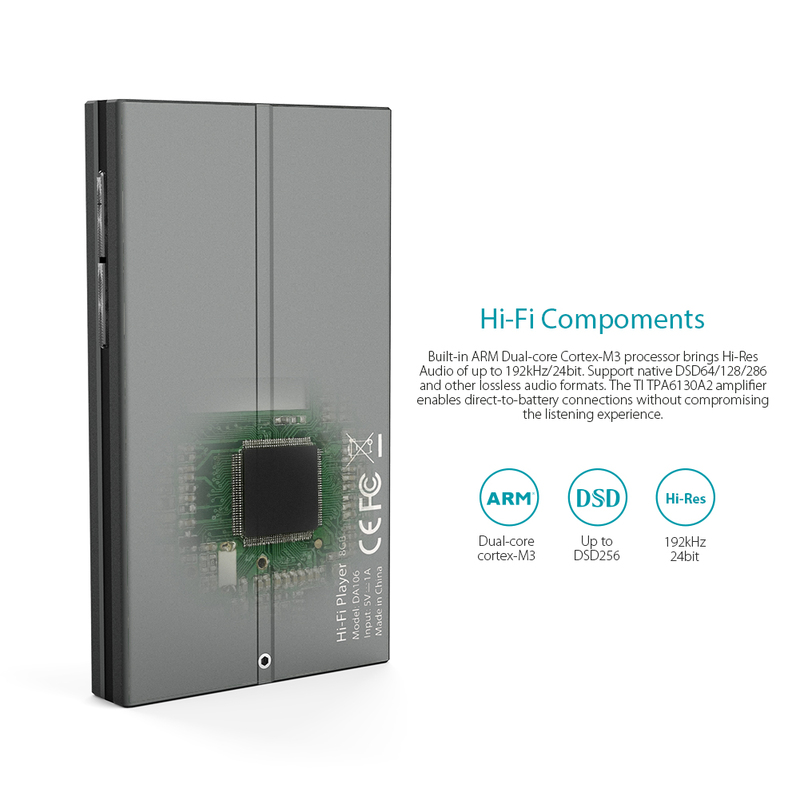 Provide fast and accurate operations with an advanced ARM Dual-core Cortex-M3 processor. The TI TPA6130A2 amplifier enables direct-to-battery connections without compromising the listening experience. Adopt the aluminum alloy shell to reduce external interface noises. Come with 8 GB of built-in memoryand a memory card slot thatsupport a TF card of up to 256GB (TF card is not included). 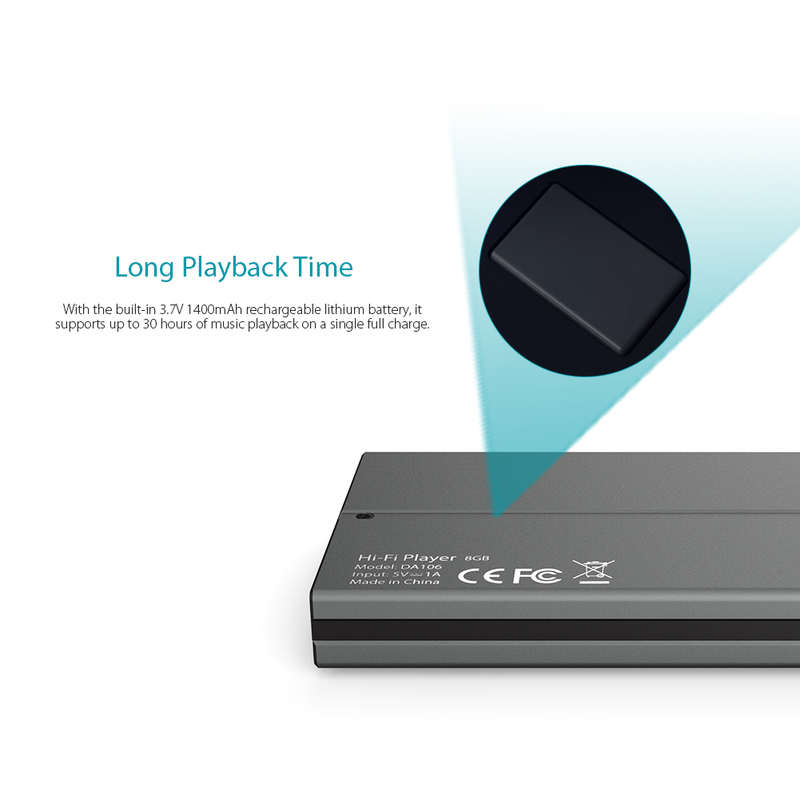 Easily transmit files between your PC, the built-in 8GB storage and a TF card via the Micro-USB port. 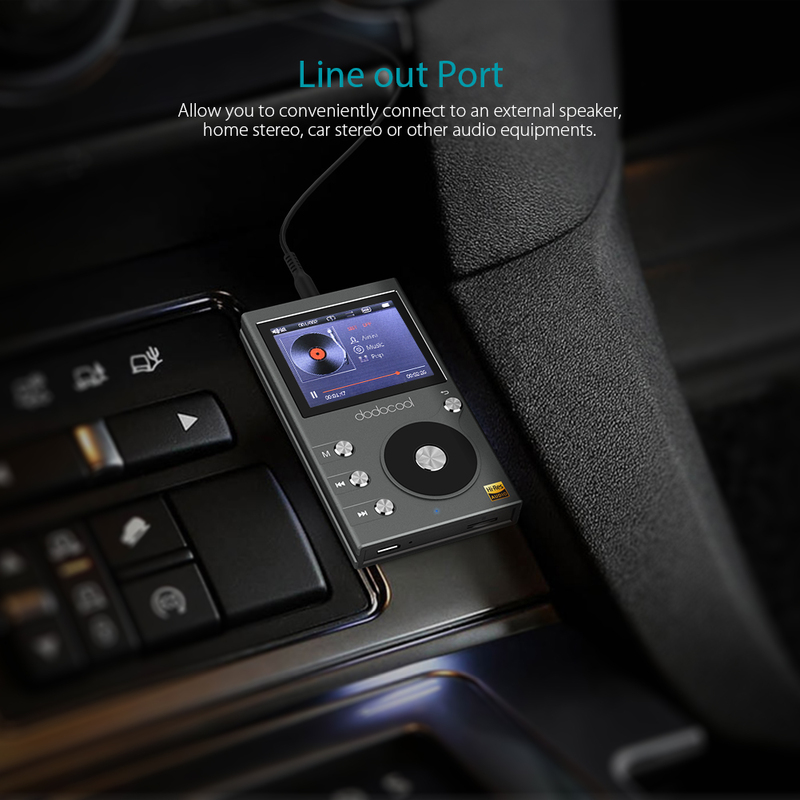 Support music playback, FM radio, high-fidelity voice recording (up to 192kHz/24PCM), line out and TF card reading. 21 different languages are available: English, German, French, Italian, Spanish, Japanese, Dutch, Portuguese, Russian and more. 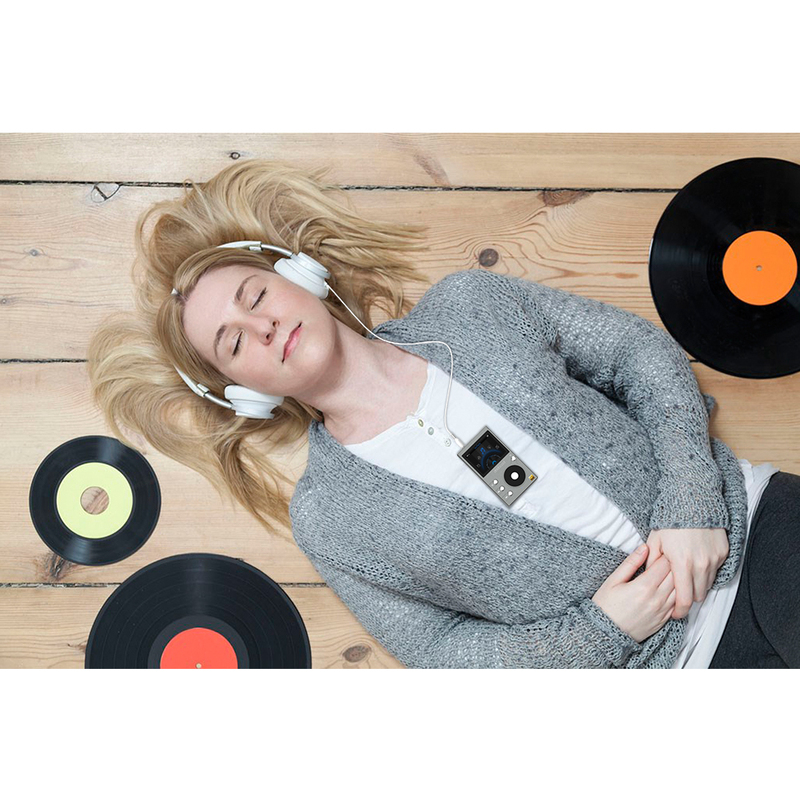 With thebuilt-in 3.7V 1400mAh rechargeable lithium battery, it supports up to 30 hours of music playback on a single full charge. The auto-off function helps to prolong battery life and prevent it from impairing your hearing. With the interface detection function, music playback will automatically pause when you unplug your headset or connection line.